Ergonomically designed for comfort -- maybe too much so! No assembly required upon delivery! Please select from the following options to complete your Standard Prayer Bench. All figures are estimates based on our latest materials, labor and freight expenses. It is unusual for us to have to change any costs except in the case of special shipping or design needs. Kneepad: Our pads are made with long-lasting, high-density foam covered by heavy duty vinyl and held in place by sturdy, hand-driven upholstery tacks. You can also have another fabric of your choosing, or even none at all. We purchase our material from Great Lakes Fabric and Jo-Anne fabrics, so you can select leather, vinyl or upholstery from them and we can use it as well -- just let us know the source and item number. 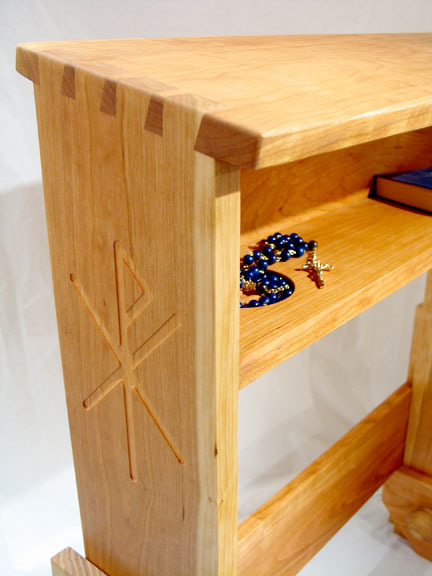 Top Detail: Our kneeler tops are made from solid 1x8 hardwoods. The edges are normally rounded, but can be trimmed to your liking using specialized router bits; the special routing is a little extra due to the fine detail sanding it requires compared to a simple rounding of the edges. We can also affix a pad if you wish. Like the knee board, we use heavy duty, textured vinyl due to its appearance, strength and ease of cleaning. However, the kneelers are very attractive and equally comfortable without a top pad. Without the pad, the wood's beauty really shows through. If you have a different material you'd prefer, you are free to send it to us prior to assembly. A Home for your Rosary: We are happy to mill an attractive cup into the shelf -- smooth or rosette style -- or attach a matching wood knob or brass hook just under the shelf for holding your rosary between prayer-times. Engraving: We can engrave a brief commemorative message onto a silver- or gold-colored metal plaque. There are two engraving lines available, each with up to about 20 characters, including spaces. On this model the engraved plate is epoxied to the center of the cross brace at the base of the kneeler.